TELAIR Air Conditioners feature new rotary compressors that provide improved efficiency while making the product even more compact. 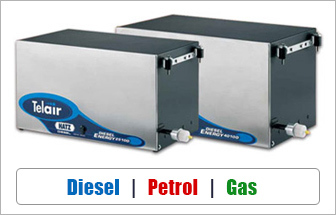 The gas type is widely available and complies with European environmental protection standards. One of the latest features enables the user to program switch-on and switch-off times with the aid of a remote control as well as control the unit instantly using the same remote control unit. 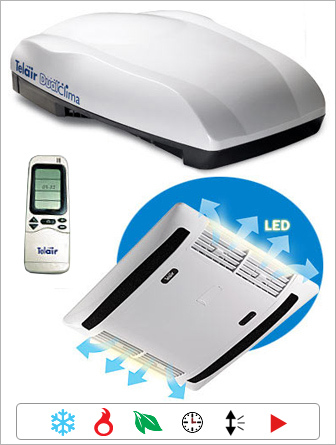 With an extra-flat diffuser for the roof of the vehicle, TELAIR Air Conditioning Units look more like a luggage carrier than they do air conditioner so they can be easily installed on the roofs of most medium to large-sized motor homes and caravans without you having to worry about excessive drag from a large piece of equipment fitted to the roof. Special care has also been taken to ensure the units operated with extremely low noise levels both inside and outside. The TELAIR range of highly efficient conditioners have already been installed by FIAT on their earth moving machines which is a pretty high accolade bearing in mind the operating temperatures those machines often work at. Please contact us for the full range of TELAIR Air Conditioners available. TELAIR also offers new types of 220/12V Current Generators running on petrol, diesel and on gas. Featuring a highly advanced engine, TELAIR generators are compact, have very low noise levels thanks to their double sound-proofed metal casings and provides savings of up to 45%. TELAIR Current Generators also resolve the irritating problem of having to have an auxiliary fuel tank as some models like the ENERGY 2510 D can be connected directly to the camper fuel tank. This model in particular is also equipped with a fully automatic electronic starter system with remote control panel and a 5 metre long cable, including: total and partial hour counter, overheating, oil and fuel level indicator lights. Please contact us for the full range of TELAIR Current Generators available.